I could never not eat pasta. Perhaps it is because of living in Italy for several years and always having pasta for lunch. Perhaps it is also down to the fact of not having pasta as often as we used to do as well. You will find below the recipe of a dish that was created by a friend of my husband who used to own a restaurant. Method: For the pasta filling brown the meat in a pan with olive oil, the sage and a clove of crushed garlic. Cook until the meat has lost most of its liquid, then add the potato cut to 1 cm cubes and continue cooking on a low heat until soft. When finished put everything in the blender with salt, pepper, the parmigiano and one small egg and mix for a few seconds until well blended. For the pasta take one large egg mix in the blender with the pecorino and a pinch of salt slowly adding the flour until you have a firm consistency. Roll to 1 mm thickness and cut the pasta into circles of approximately 6 cm in diameter. Lay the desired amount of filling onto one pasta disc and lightly moisten the edges with the remaining beaten egg, fold over and close firmly. Now cook for 5 min in salted boiling water. 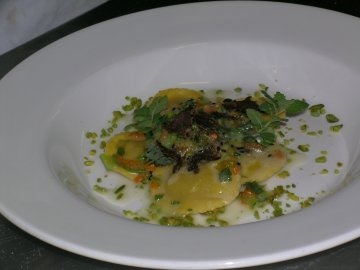 Return to the pan and toss the Agnolotti with the butter, mixed herbs and the sliced courgette flowers. Serve with a sprinkling of shaved truffle or a few drops of truffle oil. This entry was posted in Food, Italy and tagged Italian food, pasta by Cathy Powell. Bookmark the permalink.